Earlier this year I was on vacation with my family. One day we went to a large field to let a kite fly. My backpack (A Crumpler muffin top in olive green), along with other stuff, lay some dozen meters away while we let the kite soar up in the air. Another family with a big dog came along. The dog broke free and ran towards our stuff. Sniffing, turning around, lifting the leg and – peeing on my photo backpack. It lay face-down in the grass, so the richly padded back of the backpack was soaked in glorious dog-water. YUKK. I am not a dog person, and that experience did not deepen my relationship towards “mans best friend”. The owner was terribly sorry, but I opted against making a scene out of it. What should I do ? Let him pay for the backpack which is already heavily worn an torn ? Naaa. So I took the backpack home (NOT carrying it on my back), took everything out including all padding which could be removed and soaked the backpack in the bathtub. I reckon putting it in the washing machine is not a good idea, all the tumbling around could damage it. I added some shampoo and began kneadingthe backpack. Washing was necessary as you can see on the first picture. The surounding water got a green-brownish tint, so presumably some color if the backpack material (it is a green one by the way) and a lot of sweat, dust and dog pee were washed out. 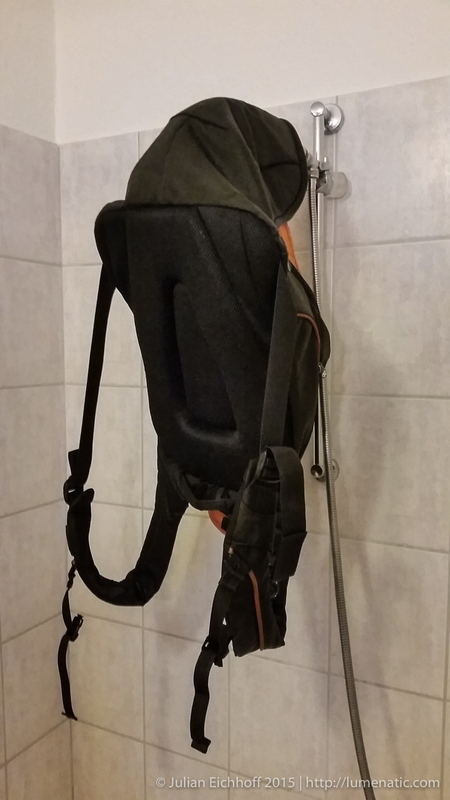 Take some time to rinse and further knead the backpack, work until no more shampoo foam is visible. 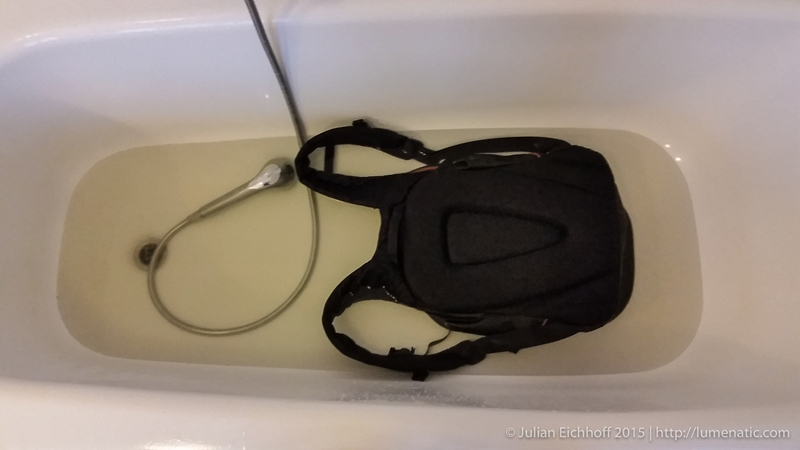 After finishing I drained the water from the backpack and pressed all the water out I could manage. 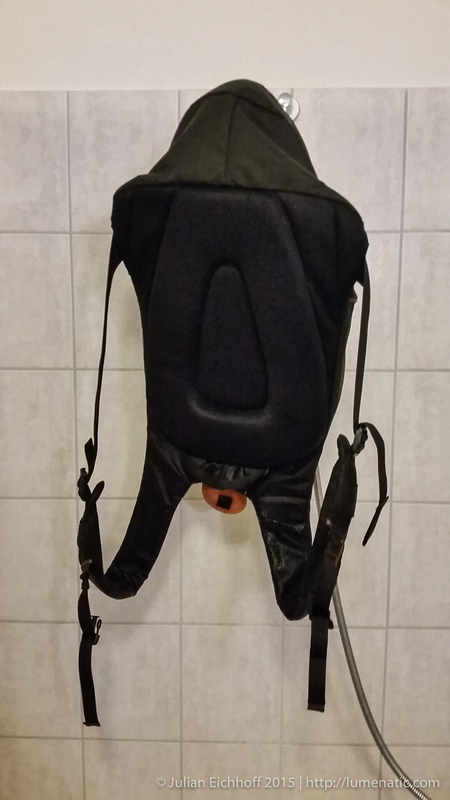 Then I opened every zipper and hung the backpack upside- down in the shower, letting it dry in the warm summer air. Bottom line: Having your backpack peed on by a dog is not funny, but also not a big drama. Most backpacks can be washed by hand and, let’s be honest, most backpacks can use a good wash after some time, even without having a dog urinate over them. had the same thing happen to my backpack, but at the beach XD ugh haha.